Responding to the theme Freespace at the 16th International Architecture Exhibition, La Biennale di Venezia 2018, Repair at the Australian Pavilion, curated by Baracco+Wright Architects in collaboration with Linda Tegg, aims to expand the point of view from the object of architecture, to the way it operates in its context, advocating a role for architecture that catalyses or actively engages with the repair of the places it is a part of. Repair aims to expand the point of view from the object of architecture, to the way it operates in its context, advocating a role for architecture that catalyses or actively engages with the environmental, social and cultural repair of the places it is a part of. Repair as an approach to architectural thinking is set to become a critical strategy of architectural culture. It is particularly relevant to Australian architects who work in one of the most diverse and ecologically sensitive landscapes in the world. Uniquely, our cities are interspersed and bordered by remnant vegetation and often connected to large natural systems as well as built over the traditional cultural landscapes of our First Nations peoples. They are also scenes of developing ecosystems at which humans are at the centre of. 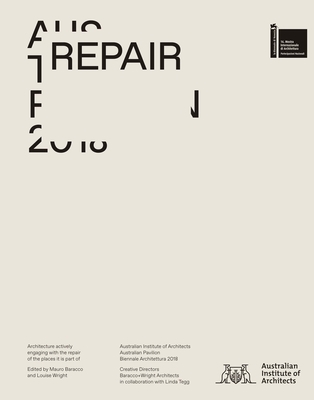 This book unpacks the theme, documents the exhibition and catalogues Australian architectural projects that are conceived through acts of repair exhibited at the Australian pavilion. With Contributions of Mauro Baracco and Louise Wright, Linda Tegg, Paul Memmott, David Freudenberger, Chris Sawyer and Susie Kumar, Carroll Go-Sam, Tim O'Loan, Giovanni Aloi, Caroline Piccard, Jonathan Ware, Lance van Maanen and Catherine Murphy.